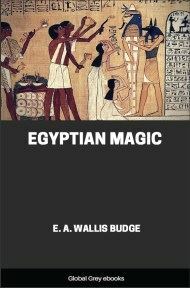 Chapters include: Thoth, The Author Of Egyptian Literature. Writing Materials, Etc; The Pyramid Texts; Stories Of Magicians Who Lived Under The Ancient Empire; The Book Of The Dead; Books Of The Dead Of The Graeco-Roman Period; The Egyptian Story Of The Creation; Legends Of The Gods; Historical Literature; Autobiographical Literature; Tales Of Travel And Adventure; Fairy Tales; Egyptian Hymns To The Gods; Moral And Philosophical Literature; Egyptian Poetical Compositions; and, Miscellaneous Literature. 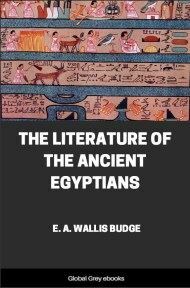 The Literature of ancient Egypt is the product of a period of about four thousand years, and it was written in three kinds of writing, which are called hieroglyphic, hieratic, and demotic. In the first of these the characters were pictures of objects, in the second the forms of the characters were made as simple as possible so that they might be written quickly, and in the third many of them lost their picture form altogether and became mere symbols. Egyptian writing was believed to have been invented by the god Tehuti, or Thoth, and as this god was thought to be a form of the mind and intellect and wisdom of the God who created the heavens and the earth, the picture characters, or hieroglyphs as they are called, were held to be holy, or divine, or sacred. 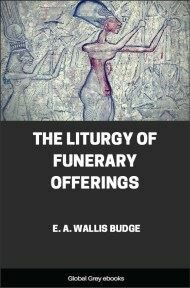 Certain religious texts were thought to possess special virtue when written in hieroglyphs, and the chapters and sections of books that were considered to have been composed by Thoth himself were believed to possess very great power, and to be of the utmost benefit to the dead when they were written out for them in hieroglyphs, and buried with them in their coffins. Thoth also invented the science of numbers, and as he fixed the courses of the sun, moon, and stars, and ordered the seasons, he was thought to be the first astronomer. He was the lord of wisdom, and the possessor of all knowledge, both heavenly and earthly, divine and human; and he was the author of every attempt made by man to draw, paint, and carve. As the lord and maker of books, and as the skilled scribe, he was the clerk of the gods, and kept the registers wherein the deeds of men were written down. 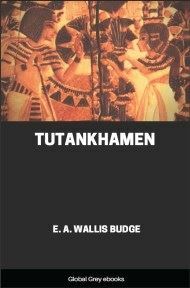 The deep knowledge of Thoth enabled him to find out the truth at all times, and this ability caused the Egyptians to assign to him the position of Chief Judge of the dead. A very ancient legend states that Thoth acted in this capacity in the great trial that took place in heaven when Osiris was accused of certain crimes by his twin-brother Set, the god of evil. Thoth examined the evidence, and proved to the gods that the charges made by Set were untrue, and that Osiris had spoken the truth and that Set was a liar. For this reason every Egyptian prayed that Thoth might act for him as he did for Osiris, and that on the day of the Great Judgment Thoth might preside over the weighing of his heart in the Balance. All the important religious works in all periods were believed to have been composed either by himself, or by holy scribes who were inspired by him. They were believed to be sources of the deepest wisdom, the like of which existed in no other books in the world. 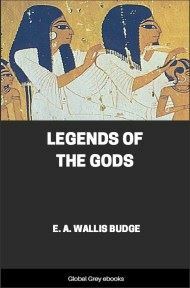 And it is probably to these books that Egypt owed her fame for learning and wisdom, which spread throughout all the civilised world. 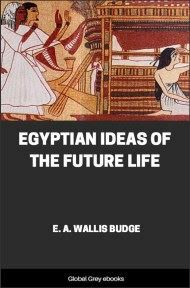 The "Books of Thoth," which late popular tradition in Egypt declared to be as many as 36,525 in number, were revered by both natives and foreigners in a way which it is difficult for us in these days to realise. The scribes who studied and copied these books were also specially honoured, for it was believed that the spirit of Thoth, the twice-great and thrice-great god, dwelt in them. The profession of the scribe was considered to be most honourable, and its rewards were great, for no rank and no dignity were too high for the educated scribe. Thoth appears in the papyri and on the monuments as an ibis-headed man, and his companion is usually a dog-headed ape called "Asten." In the Hall of the Great Judgment he is seen holding in one hand a reed with which he is writing on a palette the result of the weighing of the heart of the dead man in the Balance. The gods accepted the report of Thoth without question, and rewarded the good soul and punished the bad according to his statement. From the beginning to the end of the history of Egypt the position of Thoth as the "righteous judge," and framer of the laws by which heaven and earth, and men and gods were governed, remained unchanged. The substances used by the Egyptians for writing upon were very numerous, but the commonest were stone of various kinds, wood, skin, and papyrus. The earliest writings were probably traced upon these substances with some fluid, coloured black or red, which served as ink. When the Egyptians became acquainted with the use of the metals they began to cut their writings in stone. 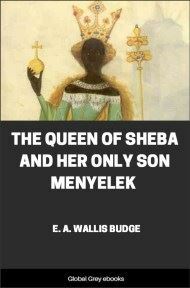 The text of one of the oldest chapters of the Book of the Dead (LXIV) is said in the Rubric to the chapter to have been "found" cut upon a block of "alabaster of the south" during the reign of Menkaurā, a king of the fourth dynasty, about 3700 B.C. As time went on and men wanted to write long texts or inscriptions, they made great use of wood as a writing material, partly on account of the labour and expense of cutting in stone. In the British Museum many wooden coffins may be seen with their insides covered with religious texts, which were written with ink as on paper. Sheepskin, or goatskin, was used as a writing material, but its use was never general; ancient Egyptian documents written on skin or, as we should say, on parchment, are very few. At a very early period the Egyptians learned how to make a sort of paper, which is now universally known by the name of "papyrus." When they made this discovery cannot be said, but the hieroglyphic inscriptions of the early dynasties contain the picture of a roll of papyrus, and the antiquity of the use of papyrus must therefore be very great.